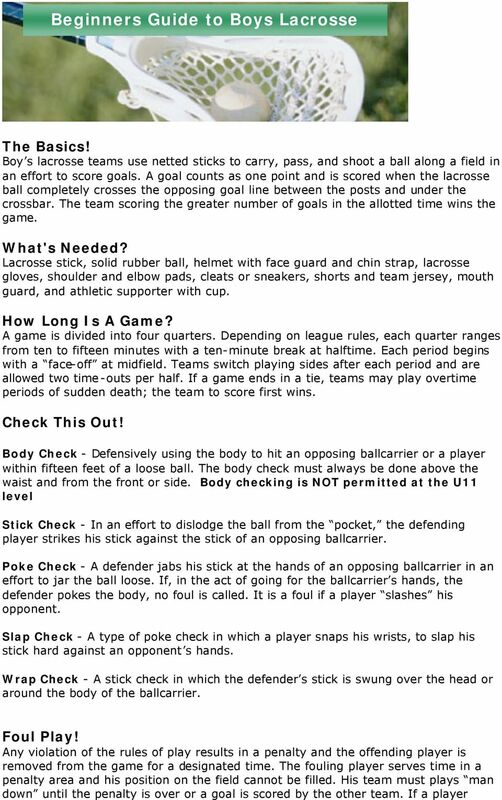 Download "Beginners Guide to Boys Lacrosse"
2 commits five fouls he is removed from play for good. The removed player s position may then be filled by a teammate. Personal Foul - A player may not trip, slash, recklessly charge, or use his stick or body to illegally check an opposing player. An illegal body check is a hit above an opponent s shoulders, below the waist, or from behind. 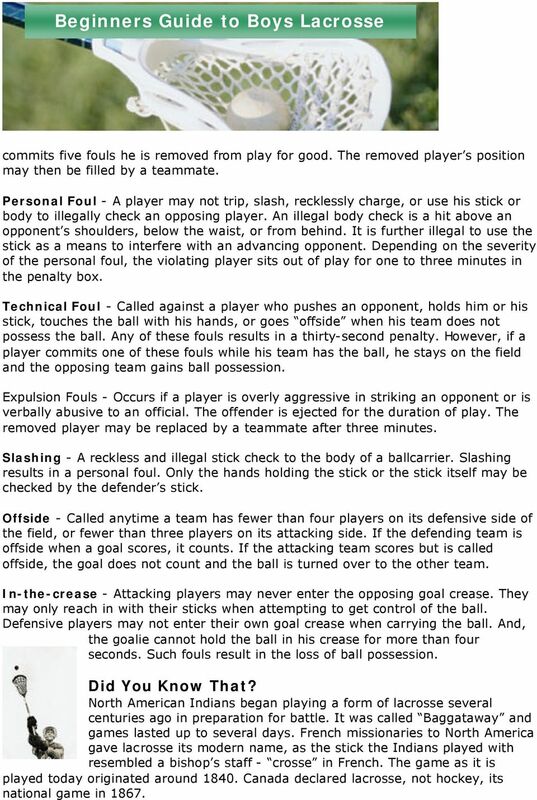 It is further illegal to use the stick as a means to interfere with an advancing opponent. Depending on the severity of the personal foul, the violating player sits out of play for one to three minutes in the penalty box. Technical Foul - Called against a player who pushes an opponent, holds him or his stick, touches the ball with his hands, or goes offside when his team does not possess the ball. Any of these fouls results in a thirty-second penalty. However, if a player commits one of these fouls while his team has the ball, he stays on the field and the opposing team gains ball possession. Expulsion Fouls - Occurs if a player is overly aggressive in striking an opponent or is verbally abusive to an official. The offender is ejected for the duration of play. The removed player may be replaced by a teammate after three minutes. Slashing - A reckless and illegal stick check to the body of a ballcarrier. 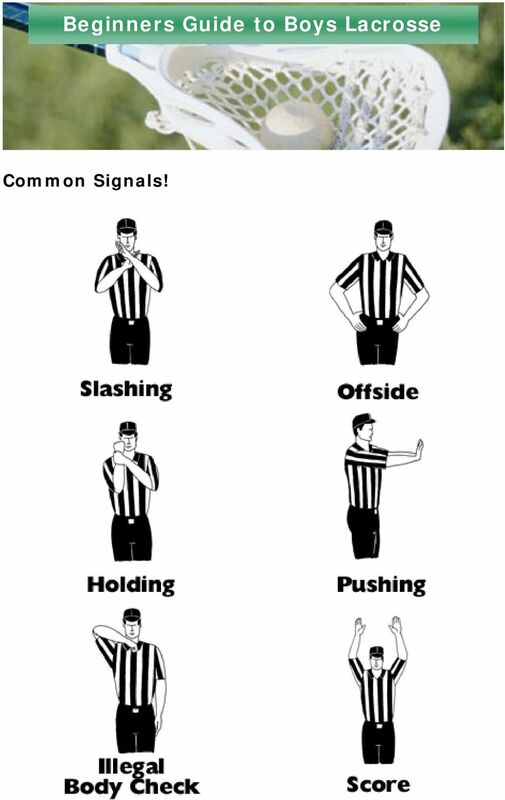 Slashing results in a personal foul. Only the hands holding the stick or the stick itself may be checked by the defender s stick. Offside - Called anytime a team has fewer than four players on its defensive side of the field, or fewer than three players on its attacking side. If the defending team is offside when a goal scores, it counts. If the attacking team scores but is called offside, the goal does not count and the ball is turned over to the other team. In-the-crease - Attacking players may never enter the opposing goal crease. They may only reach in with their sticks when attempting to get control of the ball. Defensive players may not enter their own goal crease when carrying the ball. And, the goalie cannot hold the ball in his crease for more than four seconds. Such fouls result in the loss of ball possession. Did You Know That? North American Indians began playing a form of lacrosse several centuries ago in preparation for battle. It was called Baggataway and games lasted up to several days. French missionaries to North America gave lacrosse its modern name, as the stick the Indians played with resembled a bishop s staff - crosse in French. The game as it is played today originated around Canada declared lacrosse, not hockey, its national game in 1867. 3 Who Plays Where? Two teams of ten players are on the field at one time. Teams usually line up with one goalkeeper, three defenders, three midfielders, and three attackers. On face-offs, players must remain in their respective playing zones until one team gains possession of the ball. Also, teams must have at least four players in their defending half and three players in their attacking half of the field at all times of the game. Any player may score a goal and every player must contribute on defense when necessary. Substitutions may take place any time during the game. Midfielders (or Middies) - As the main ballcarriers on the team, middies cover the entire length of the field playing both offense and defense. Their responsibilities are to bring the ball up the field into the attack zone to set up offensive plays and scoring opportunities with their attackers. 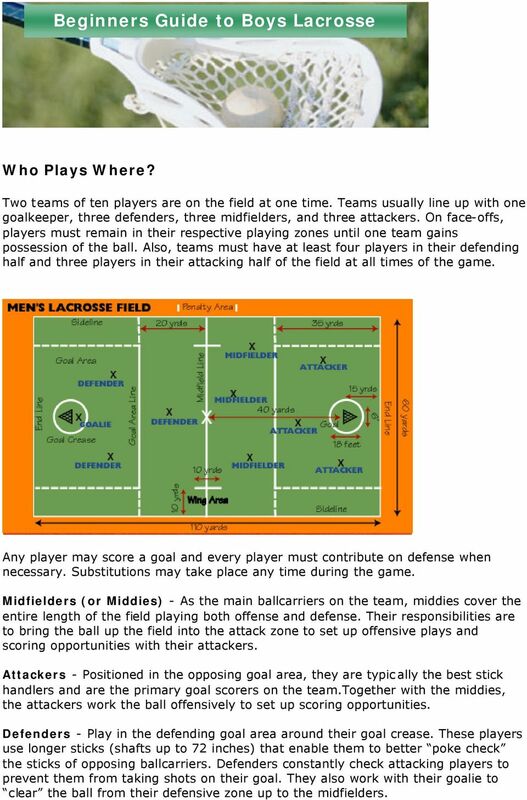 Attackers - Positioned in the opposing goal area, they are typically the best stick handlers and are the primary goal scorers on the team.together with the middies, the attackers work the ball offensively to set up scoring opportunities. Defenders - Play in the defending goal area around their goal crease. These players use longer sticks (shafts up to 72 inches) that enable them to better poke check the sticks of opposing ballcarriers. Defenders constantly check attacking players to prevent them from taking shots on their goal. They also work with their goalie to clear the ball from their defensive zone up to the midfielders. 4 Goalkeeper (or Goalie) - Plays inside the goal crease in front of his team s goal. He uses a larger headed stick (up to 15 inches wide) to best defend against oncoming shots. He is the only player allowed to touch the ball with his hands, but can only do so when blocking shots inside his goal crease. He may not control the ball with his hands, only with the stick. Learn the Lingo! Clamping - On the face-off, a player pushes the back of his stick down on the ball in the attempt to gain control of it. Clearing - An important defensive maneuver where defending players run or pass the ball out of their goal area. Clearing is best done along the sidelines, away from the front of the goal. Cradling - In order to maintain control of the ball when moving along the field, players turn their wrists and arms to cradle the ball in the stick pocket. Crank Shot - A shot on goal in which a player takes a backswing wind-up and fires the ball underhand or sidearm. Crease - The eighteen-foot diameter circle surrounding each team s goal. Cutting - An attacking player without the ball darts around a defender toward the goal in order to receive a feed pass. 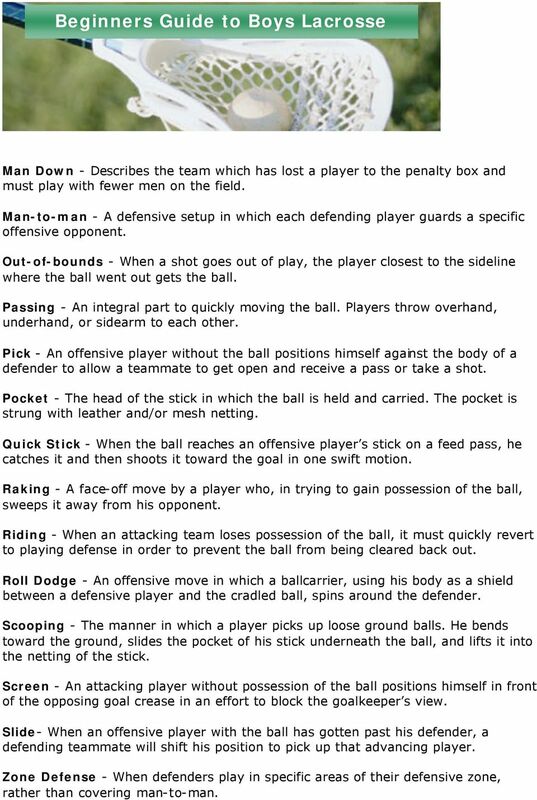 Extra Man (or Man Up) - Describes the team at a player advantage in a penalty situation. Opposite of man down. Face-off - Takes place at the start of each quarter, after every goal, and after certain dead balls. Two opposing players crouch down at midfield, hold their sticks flat on the ground and press the backs of their stick pockets together. The ball is then placed between the pockets and, when signaled to start, the players rake or clamp on the ball to vie for control. Face Dodging - A player with the ball cradles the stick across his face in an attempt to dodge a stick-poking defender. Fast Break - When an offensive team quickly mounts a scoring attack enabling them to gain a man advantage over the opposing defense. Usually a four on three. Feed Pass - An offensive play in which one player passes the ball to a cutting teammate for a quick stick shot on goal. Ground Balls - Players compete for the control of loose ground balls by stick checking opponents away from the ball while simultaneously trying to scoop it up. 5 Man Down - Describes the team which has lost a player to the penalty box and must play with fewer men on the field. Man-to-man - A defensive setup in which each defending player guards a specific offensive opponent. Out-of-bounds - When a shot goes out of play, the player closest to the sideline where the ball went out gets the ball. Passing - An integral part to quickly moving the ball. Players throw overhand, underhand, or sidearm to each other. Pick - An offensive player without the ball positions himself against the body of a defender to allow a teammate to get open and receive a pass or take a shot. 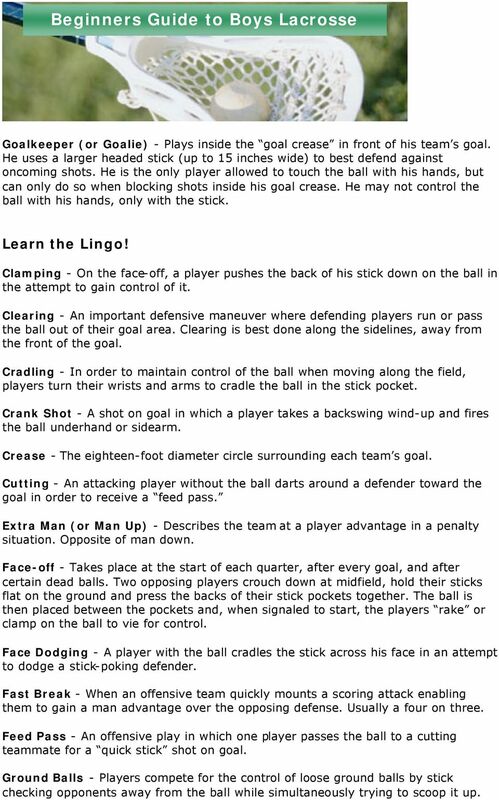 Pocket - The head of the stick in which the ball is held and carried. The pocket is strung with leather and/or mesh netting. Quick Stick - When the ball reaches an offensive player s stick on a feed pass, he catches it and then shoots it toward the goal in one swift motion. Raking - A face-off move by a player who, in trying to gain possession of the ball, sweeps it away from his opponent. Riding - When an attacking team loses possession of the ball, it must quickly revert to playing defense in order to prevent the ball from being cleared back out. Roll Dodge - An offensive move in which a ballcarrier, using his body as a shield between a defensive player and the cradled ball, spins around the defender. Scooping - The manner in which a player picks up loose ground balls. He bends toward the ground, slides the pocket of his stick underneath the ball, and lifts it into the netting of the stick. Screen - An attacking player without possession of the ball positions himself in front of the opposing goal crease in an effort to block the goalkeeper s view. Slide- When an offensive player with the ball has gotten past his defender, a defending teammate will shift his position to pick up that advancing player. Zone Defense - When defenders play in specific areas of their defensive zone, rather than covering man-to-man.